fleet street fox: Tell 'em to blog off. "A free and open world increasingly depends on a free and open internet. The internet empowers everyone — anyone can blog, create, learn, and share. It is controlled by no one — no single organisation, individual, or government. It connects the world. Today, more than two billion people are online — about a third of the planet. Hacked Off supporter Max Mosley told parliament he wants the government “to cut off the wires” to websites he thinks should be censored. Millionaire celebrities like Hugh Grant want to regulate free speech on the internet. They want laws to force dissident refusenik bloggers to risk paying exemplary fines if they refuse to submit to the regulator. 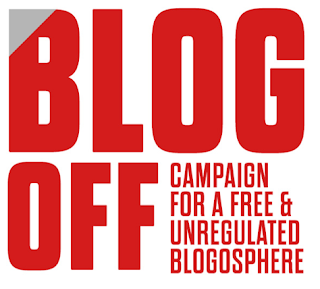 The Hacked Off-drafted press control Royal Charter aims to regulate any blog which carried news-related material aimed at readers in the United Kingdom. Tell Max Mosley we will not be cut off, tell Hugh Grant we will not be regulated, we will not be fined. Keep the world wide web open and free. Sign the petition here."